Yes, I'm biased. But I think a book chronicling UConn's unlikely run to the 2014 national championship would make a great stocking stuffer? Don't you? 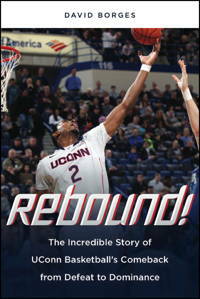 Anyway, I'll be signing copies of my book, Rebound: The Incredible Story of UConn Basketball's Comeback from Defeat to Dominance, on Saturday at the UConn Co-Op Store, prior to the Huskies' noon bout with Ohio State, starting around 11 a.m. Yes, the title is a little vague. Yes, they should have put Shabazz on the cover. But it is the story of UConn's run to the '14 title, starting at Kevin Ollie's 2012 introductory press conference and ending at Jerry's World in Arlington, Texas. Anyone filtering through the store en route to the UConn-Ohio State game across the street at Gampel at noon, we'd love for you to come by! Hope to see you on Saturday! (And if you can't make it, we'll have a signing on Monday at 7 p.m. at the Barnes & Noble at the Buckland Hills Mall in Manchester). Getting back to Saturday's game, Ollie is looking for the Huskies to get tougher. And that means tougher from the get-go. He also realizes that time is tickin', and the idea that new players still have to "feel-out" their place with UConn's returnees is over. One interesting subplot: While UConn had to go up against a player (Diamond Stone) who spurned its advances on Tuesday night, the script gets flipped on Saturday, when the Huskies feature a player (Sterling Gibbs) who spurned Ohio State's advances last spring.